A number of drought and water bills were introduced to the California State legislature this month. The drought update will take a look at this recent development. Introduced on February 10, 2016, this third proposal by Sen. Feinstein includes both short- and long-term provisions to allocate California’s water supply in dry times among many competing interests. It authorizes $1.3 billion for desalination, water recycling, surface water storage, and other grants. Focus is also given to easing limits on water transfers south of the Delta, but the bill does not mandate specific pumping levels. The Senator claims that the bill does not violate the Endangered Species Act, the Clean Water Act, and the Biological Opinions. 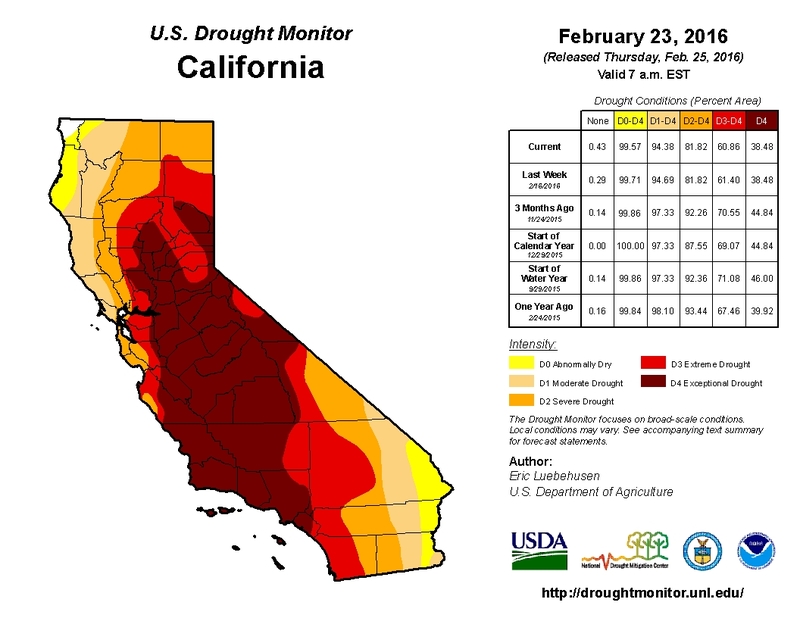 On February 23, 2016, Congressman John Garamendi (D-Fairfield, Davis, Yuba City) announced his plan to introduce another drought bill, which is intended to be a companion to the one developed by Sen. Feinstein. This move may be a result of concerns over future compromises to allow for increased diversions to farms in the south. New legislation, introduced by Assemblymember Bill Dodd (D-Napa) on February 2, 2016, aims to create a water transfer information clearinghouse to provide a platform for sharing water data. Current databases containing information on hydrology, biology, water quality, and water use are difficult to access and use to make decisions on water transfers in dry times. Assemblywoman Ling Ling Chang (R-Diamond Bar) introduced a bill to encourage the production of potable water through desalination on February 12, 2016. It would urge the State Water Board to find economic and efficient methods to desalinate water to meet future demands. Currently, the bill does not specify desalination targets, but Ms. Chang is looking to establish a statewide goal before the final vote in August. The Department of Water Resources (DWR) released draft Groundwater Sustainability Plan Emergency Regulations. The regulations set standards and a framework for local public agencies to define a course of action to achieve sustainable groundwater management within 20 years of plan implementation. Local groundwater management plans must identify problems relating to groundwater (e.g., overdraft and seawater intrusion) and determine specific projects and management actions to address them. The DWR will provide technical and financial assistance for local agencies to develop their plans. State Water Board authorized $960 million in 1% financing for near-term recycled water projects, funded through the Clean Water State Revolving Fund (CWSRF). Currently, 36 projects totaling 150,000 acre-feet of additional water annually are eligible for the 1% financing. A recent UC Santa Cruz study notes limited research on sustainable groundwater management in critical groundwater basins of Southern California and Central Coast areas. While these regions had solved some conflicts between water users through an adjudication process, they lack mechanisms to manage groundwater resources sustainably. Water use practices do not take into account climate change nor address accumulated overdraft problems. The researchers recommend sustainable management requirements such as annual reports, specifications of safe yield and overdraft, procedures to reduce pumping, and triggers to spur further action. The US Bureau of Reclamation officials are still trying to determine their initial allocation of Central Valley Project water for 2016. The Project typically makes its initial allocations to cities, farms, and other entities in late February, but may require more time this year as weather predictions appear mixed. On the other hand, the Department of Water Resources has increased State Water Project allocation to 30%, a change from 15% announced a month earlier. This allocation may change again if more rain and snow arrive in California. The Metropolitan Water District (MWD) announced that it may discontinue its turf rebate program. In a proposed budget for the next two fiscal years, MWD staffers recommended a conservation program budget of $27 million for 2017, and $32 million the year after. Funds will be allocated to an indoor water-efficient device rebate program, with no plan to reopen a turf rebate program. In February, California experienced record-high temperatures, especially in Southern California. The proximal cause of this record warmth and mid-winter dry spell is the development of a strong high pressure system that is aligned with the West Coast of North America. Seasonal forecasts have consistently underestimated the magnitude of subtropical ridging, which is causing many parts of California to remain dry despite El Niño conditions. Drought conditions show no significant changes over the last two weeks. Wetter-than-normal conditions in the past week were confined to the northern-most counties and some parts of the Sierra Nevada. The federal Climate Prediction Center expects drier and warmer-than-normal conditions through much of California over the next two weeks, except for the North Coast. However, above-average rainfall in much of the state is expected for over the next three months. Snow-water content dropped to 85% for this date, as of February 29 (see these snowpack plots for changes over time). Cumulative precipitation is still on course with the 1922-1998 average (see the Northern Sierra, San Joaquin, and Tulare Basin precipitation index charts). 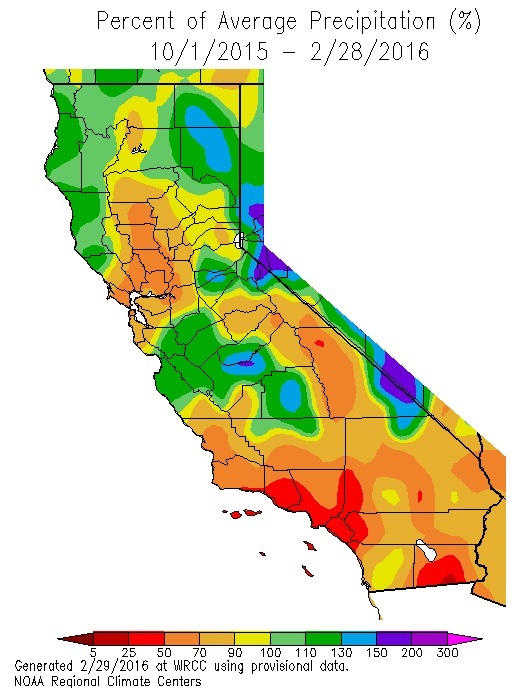 March-April-May forecast for California shows above-median rainfall. The outlook through early spring is likely associated with El Niño. 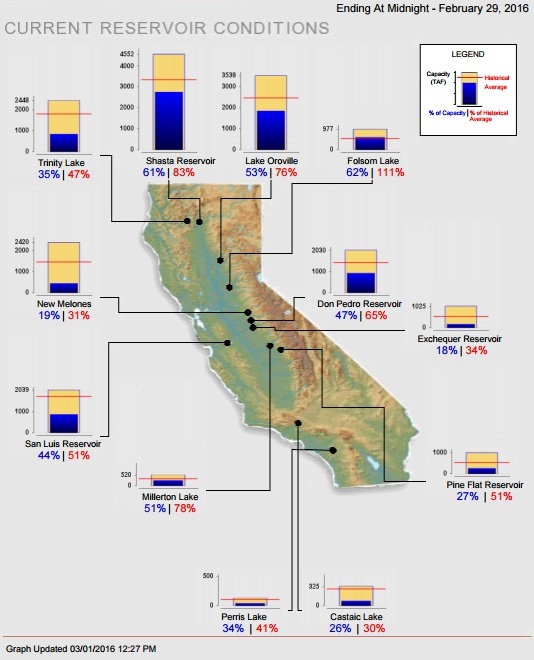 Water levels in California’s major reservoirs (representing 27.3 million acre-feet of storage) have slightly increased to 42% of statewide capacity, compared to 40% two weeks ago. These levels also represent 63% of group historical average, and 93% of what they were last year. Major reservoirs such as Lake Oroville, Shasta, and Folsom are now at 75%, 83%, and 112% of historical average, respectively.